This where we honour our collaboration partners. the [sameness] project + others = some beautiful happenings. Our collaboration partners are the people and groups we have been honoured to create, brainstorm and work with. We've been able to add our [sameness] flavour to other cool projects, initiatives, and events happening in Dubai. Partners of Ernst & Young sit down together for the first time for a chat. EY is a large company with partners who have full schedules and are not always able to meet with one another. We installed #TheConversationChair in their Dubai offices and partners were invited to sit down, take a breath of fresh non-corporate air, have some M&M's, and talk to another human-being in agenda-less chit chat. GeekFest Dubai invited us to give a Geektalk at their evening which was held at Market Outside The Box in the Burj Park. The evening combined innovative thinkers and their projects, and a open-eared and receptive community crowd. 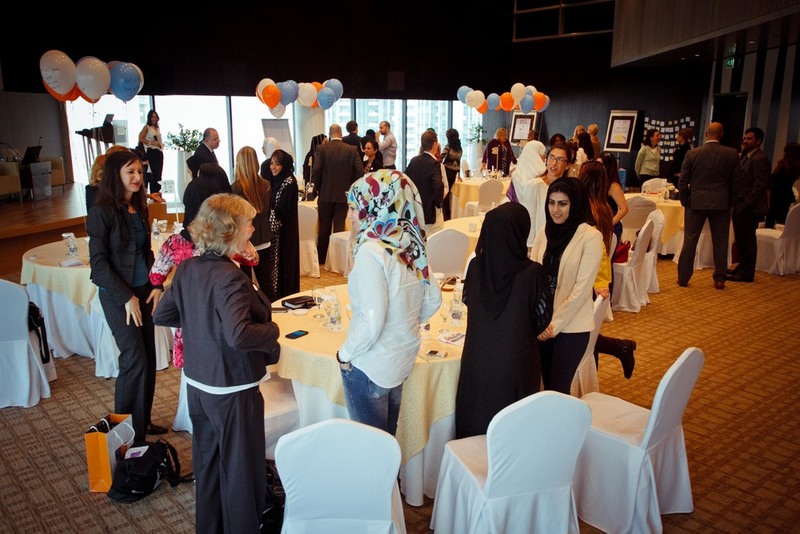 the [sameness] project was invited to run a speed networking session at Dubai Chambers for the Engage Dubai Fair. #TheConversationChair style networking session was designed, and attendees paired together to snap one another's shoes for i got sole. Participants were also invited to take a not & leave a note: take one inspirational note, and leave a note of their own behind. We ran #TheConversationChair at Gyem's Open Mic Night at JamJar in Al Quoz. The evening's theme was 'Passion Is...' We saw lots of young people share their talents, what they are passionate about, and the effect an entire room of passionate people can have on the atmosphere. Young people chit chatted and performed on stage. Street Art Night Al Quoz Street 4b | #TheConversationChair. Street Art Night Dubai invited #TheConversationChair to colour up the street. An event by All Quoz Beautification Project who have a grand vision of a neighbourhood where local and regional artists are encouraged to visually leave their marks on the environment. FitnessLink Co-Founder Grant Goes demonstrates some stretches and offers health advice to a group of RTA Taxi Drivers. FitnessLink are a community of awesome individuals who are passionate about fitness. They are our official collaborators for our project We've Got Your Back, a project that promotes the long term physical health and emotional well-being of Taxi Drivers in Dubai. National Day at PepsiCo | the staff snapped their shoes with a polaroid and shared their stories. PepsiCo invited us to their UAE National Day celebrations at their headquarters in Downtown Dubai. We ran an i got sole activity where staff members took polaroids of their shoes and answered some personal questions about themselves. #TheConversationChair with a National Day theme was also present and saw people getting to know one another beyond being 'just colleagues' in the workplace. Archive Fall Fair | Two strangers chat on #TheConversationChair. In celebration of Fall, The Archive Fall Fair brought the community of Dubai together to enjoy some great weather and fun outdoor events. 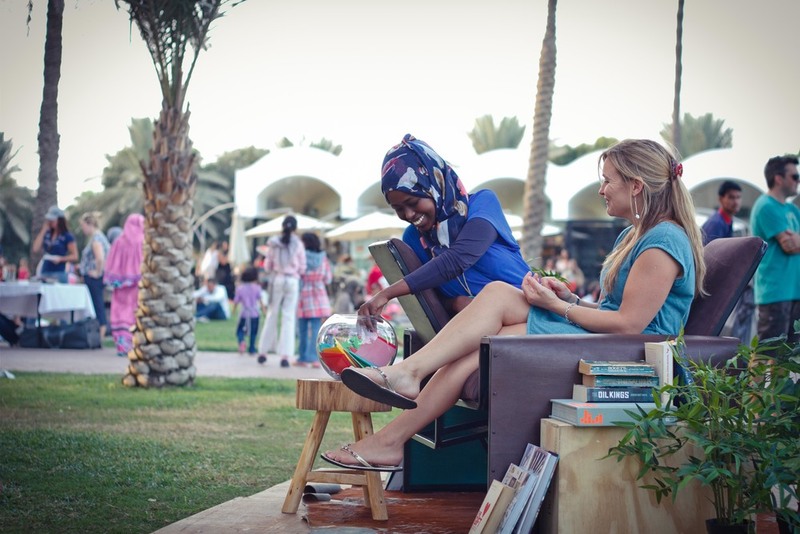 #TheConversationChair was invited to Safa Park as one of the many attractions bringing people together. The day served as great reminder of both how small and big Dubai can be. Under the tallest building in the world, strangers sat and got to know one another, and helped make the world just a little bit smaller. the [sameness] stall | Hanging out at Repton School Fair. the [sameness] project was invited to the Repton School Fair to introduce parents to projects such as Water for Workers and One + One, to illustrate ways that families can be involved. Amongst the many new friends we made, we also have some amazing new volunteers and interested partners for future projects. The Sustainability Platform are a Social Impact Consultancy company who focus on creating sustainable, scalable and measurable social impact. The Sustainability Platform came on board our project We've Got Your Back to help measure the happiness impact on the Taxi Drivers our team met during each visit to RTA. Pecha Kucha at The Archive | The sharing of ideas under the tallest building the world. Pecha Kucha Dubai is a bi-annual event run each year. At the end of 2013 it was held at The Archive with Third Line Gallery and S*uce teaming up to host it. 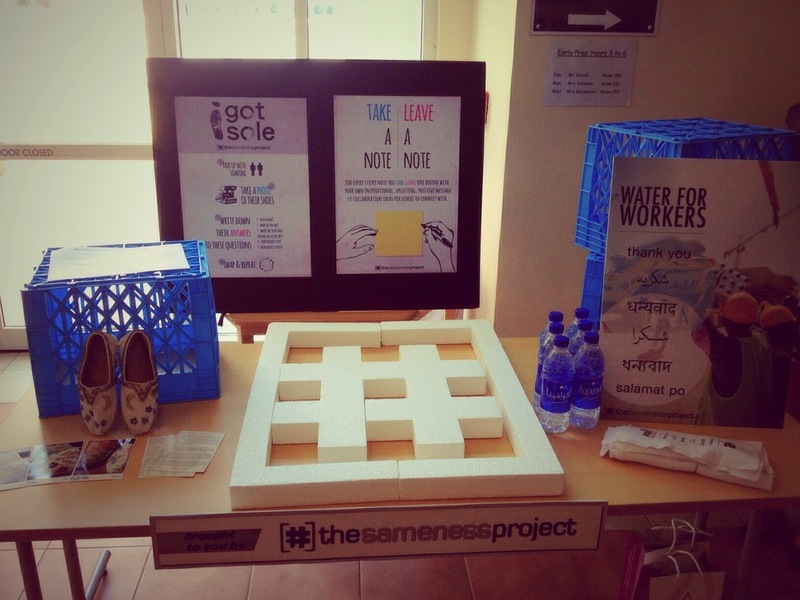 the [sameness] project was invited to introduce our various projects and to tell Dubai what we're doing. Jonny presented on behalf of the [sameness] team. A chat outside The Shelter | Two strangers who sat down together found out they are both photographers and shared trade secrets. For Art Dubai 2013 #TheConversationChair premiered at The Shelter in Al Serkal Avenue, Al Quoz. As people strolled down the lanes taking in the live artwork and freshly opened exhibitions, #TheConversationChair introduced strangers to one another. Some sat for 5mins, to 50mins. Nina from Traffic Gallery sits down with a stranger for a chat at The Market of Everything. The Market of Everything takes place bi-annually at Traffic Gallery in Al Quoz. The Market is a mix of 2nd hand goods, new knick knacks and local clothing designers. This super relaxed venue had regular visitors wandering in throughout the day, and we met many familys and bargain hunters. #TheConversationChair added an extra element to the Market. This was Traffics' final event before they closed shop for good, a bittersweet ending.